The food industry make us fat. Greedy food companies don't care about us, they put profits ahead of people. If you want to eat healthy, it's gonna cost you. Big Food is in bed with Big Government and they're screwing up our food supply. Now, these sentences may ring true to you or they may ring false. That's not my point. Instead, rather than seeing them as either fact or fiction, I'd like you to think of these statements as lenses. A quick sidebar on what I mean by "lenses." Let's say you pick up a blue lens and look through it. No matter how hard you try, as long as you're looking through that blue lens, you simply will not be able to see the color red. You might see magenta, or some kind of purplish color, but you'll never see anything approaching a real, honest-to-goodness red. Let's take it one step further. Let's say you're peering through that blue lens when you look at your world... but you don't actually know that you're using a blue lens. You're walking around like you're in some Bono lookalike contest, but you're completely unaware of it. Imagine how the world would appear to you through these lenses: people around you would talk about some color they call "red" but you won't see any evidence of it, anywhere. You just won't see it. I mean, if there were really a color red there'd be at least some proof, right? Clearly those "red-seers" must be deluded--or biased, or even crazy. They just.. they just don't get it! Can't they see? Idiots. Perhaps it even gets to a point where you start to get offended by all those idiots who claim to see red. You actively avoid those deluded red-seers, and you begin to surround yourself with like-thinking people who, like you, simply don't see or believe in the color red. You look great in your invisible blue wraparound sunglasses, and you (and everyone you've surrounded yourself with) believe you see the world exactly as it is. In other words, it's easy to see how using a lens like this can distort your reality--without you even knowing it. Okay. 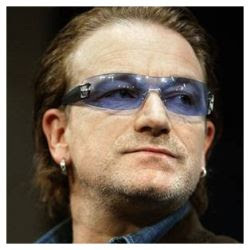 Let's give those blue lenses back to Bono and head back to the reality of our food industry. The food industry offers many foods at extraordinarily reasonable prices, but it also offers us various traps and challenges. Sometimes, it markets aspirational food products at prices totally divorced from their value. At other times it offers simple, healthy and unprocessed food at great prices. And, yes, it offers fattening foods that are delicious, heavily processed and unhealthy when eaten to excess. But when you think about the food industry, what kind of mental lens do you use? Do you use an empowerment-based lens, or do you use a disempowering lens? Does the lens you use help you navigate your food choices effectively? 2) These healthy foods are expensive. Let me look for other less-expensive alternatives. 3) I choose not to respond to that advertisement. All of these statements are active. All are choices. And the person who uses these statements is most likely going to have good results navigating the food industry. 1) These food companies are feeding me unhealthy food. They deliberately design these foods to be irresistible. 2) The government should get more involved in our food supply to make things more fair (or, the opposite: The government is already too involved in our food supply, introducing unfair distortions). 3) The food industry takes advantage of people. These statements are all passive. They are reactive, rather than active. And a person using statements like these will likely have trouble finding foods that meet his needs, because he's chosen a mental lens that makes it more difficult to do so. You could even argue (particularly in the case of the third statement) that his choice of lens not only disempowers him, it leads him to assume other people are powerless too. Be careful what you wish for. So, which lens helps you most when you decide what to buy and what to eat? Which lens helps you help others? Readers, one of these lenses is effective, the other is clearly not. One final thought: Note that I haven't addressed the trueness or falseness of either group of statements. In fact, both groups of statements could be true or false. It depends on the evidence you seek out to support or debunk the statements. And the evidence you choose to seek out depends on the kind of mental lens you use to observe your world. It's disturbingly circular, isn't it? And yet it's also deeply empowering, because once you begin to pay attention to the kind of lenses you use to look at the world, you realize that you can actually choose the lens that helps you be most effective. So which mental lens would you rather use: the lens that lets you be acted upon, or the lens that helps you take action? The lens that assumes you have no choices, or the lens that lets you see all of your choices? By now it should be clear that I'm talking about much more than just how consumers interact with the food industry. We hold much more power than we think. It's just that too many of us don't know it, or wear a lens that enables us to refuse to know it. This realization is the first step towards becoming a truly conscious consumer. This post draws inspiration (and steals ideas) from two sources: The Art of Confident Living by Bryan Robinson, and Personal Development for Smart People by Steve Pavlina. I'm grateful to both authors. Excellent post, as always! I happen to think all of those statements are true, but I have always felt it is my responsibility (and mine alone) to eat healthily, and so I must make the effort to do so. It's a bit like driving: there are responsible ways of doing it and there are irresponsible ways of doing it. We all know the difference and we all decide which way we behave. It might take a bit more effort to learn how to do it properly, but once you've figured it out it becomes second nature. Brilliant, Dan. My only quibble (as a photographer) is that the blue "lens" is actually a blue "filter." :-) Picky picky picky. I wrote something directed to similar mental blocks a while back. Everyone uses mental filters to some extent, and it's not all that easy to identify them unless a person is willing first to be conscious and mindful of their reactions to stimuli, and then to dig deeper to figure out why they have that response. I fear it never occurs to most people to challenge their own worldview. Dan, since you often ask your readers to think critically, I would like to point out that you're presenting your sets of lenses (or filters) as if they are the only two possible ways of looking at the food industry. You present a binary--empowered/victim--when I think that there are likely other possible lenses or filters through which to look at this issue. For example, what about the situation of those who may simply be unaware of or uneducated about food choices or advertising/labeling, and who would benefit from some guidance from government or other agencies? Are they automatically "victims"? It takes time and energy to become empowered (and I speak as one who took that time and energy to become so)--what do you call the lens of someone who is just learning, just beginning to question, but not yet empowered? I'm sure your other readers could come up with more examples. I am leery of binary labels and I would suggest that such black-and-white thinking does not leave room for the more common gray areas that come up in life. Great comment Joanne. I don't disagree with you, but the purpose of this post was to address the concept of lenses more than it was to discuss a taxonomy of lenses. You're right that life isn't binary. However, the definition of a victim, at least in the sense that I'm using it here, is someone who gives away their power. Thus the hypothetical person you're talking about--the one who's beginning to learn, to question things and to think for him/herself--cannot be a victim.